Daniel Olivella keeps things traditional and casual at his new restaurant and wine bar. The 3 Gazpachos are attractively presented. 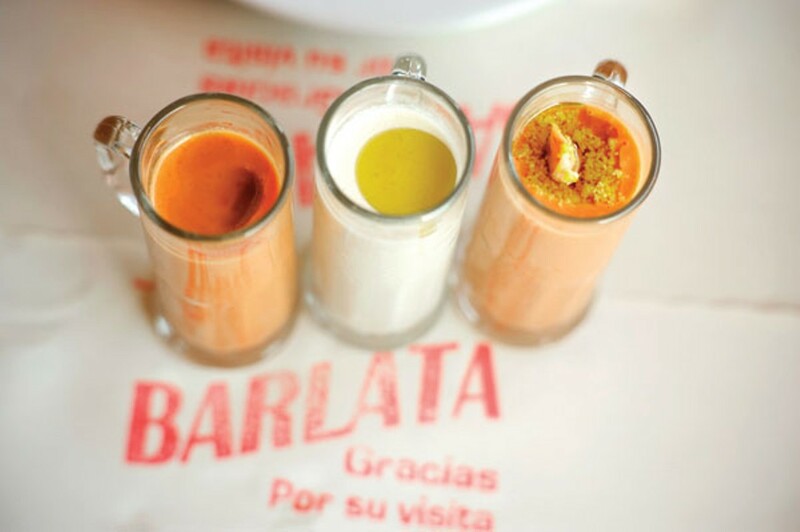 Barlata looks and feels like a cool Barcelona hangout, where students with knapsacks and old men in berets drop by for a glass of wine or a saucer of almonds and pass the evening in a nimbus of good talk, communal noshing, and crema catalana. Big windows let in plenty of sunshine. Rustic-mod light fixtures, blood-red walls, a planked-wood ceiling, and vivid artwork of Iberian sardine cans summon the spirit of Gaudi. There's a long twenty-seat table down the middle of the dining room where friends and strangers alike can get to know one another better over platters of pulpo and paella, and the seven-seat marble-topped wine bar is a fine place to compare and contrast the fermented grape juice of Galicia, Navarra, and Castilla. Chef-owner Daniel Olivella, a native-born Catalan from a village just outside Barcelona, knows how to bring a bit of the homeland to the Bay Area. After stints at the Zuni Cafe, ThirstyBear, and the late and sorely missed Maltese Grill in the city, he opened the hip yet upscale B44 in 1999, introducing the Belden Alley crowd to the pleasures of mel i mató. Barlata, his latest venture (it opened in March), is a more casual sort of place: No reservations are accepted, the layout encourages friendly interaction, and the menu lets the passerby sup on anything from a glass of manzanilla to a multicourse meal. Olivella has also resisted the temptation to tart up his 35-item tapas menu with seared mizuna and other California whimsicalities, focusing instead on such tried and true specialties as octopus and anchovies, salt cod and romesco, sardines and omelets, and chorizo and allioli. We began our meal with three varieties of Andalusian cold soup, attractively presented in fluted glasses for easy sipping: ajoblanco, a creamy, mildly tangy concoction of garlic, almonds, and thick golden olive oil; salmorejo, a rich and smoky tomato bisque draped with Serrano ham; and an especially vernal gazpacho bursting with the flavors of cucumber, parsley, and sweet pepper. Xató, a traditional Catalan dressing of ground nuts, garlic, olive oil, and vinegar, was served on a tangle of spiky frisée with bits of bonito tuna and dollops of puréed salt cod: a bright and surprisingly copacetic dish. Less enticing was the pulpo (octopus), a rubbery, paprika-draped misfire despite its two-hour cooking time and whimsical presentation in a shiny new sardine can. One of the restaurant's best tapas was the tortilla con chorizo, a hearty potato-sausage omelet far tastier than the usual reheated frittata. Another classic Spanish dish, brandada, skillfully tempered salt cod's often fishy, ponderous nature with just fluffy enough mashed potatoes, roasted garlic, and walnut oil. The lamb meatballs with squid and chocolate sauce didn't quite come together — the sauce had a nice smoky earthiness to it, but what's with the squid? — and the blood sausage, while crisp, spicy, and snappy as all get-out, was on the overcooked side. But the dozen tiny clams sprinkled with chopped chorizo and creamy white beans was a sweet, briny treat, and the oxtail, braised for five hours until tender and succulent and served with creamy puréed potatoes, was comfort food in any language. When it came to the few non-tapas selections, I once again opted for paella and was once again disappointed. Although I like the idea of paella, I've seldom had one that tasted as good as it sounded, and Barlata's rendition is no exception. It looked great, brought to the table in a rustic paella pan crowned with jumbo prawns, and the whole steamy-succulent saffron-seafood concept is tantalizing. But in the end it was the same old mishmash of nondescript rice, rubbery textures, and muddled flavors. The desserts were the best things on Barlata's menu. The crema de carajillo looked like a thick mug of frothy cappuccino but was actually a rich, creamy espresso-flavored mousse topped with brandy-infused foam and a crunchy little churro dipped in white chocolate. The plato de dulces was a treasure trove of chocolate-covered orange peel, chewy almond cookies, dark, bittersweet chocolate bark studded with peanuts, and luscious brandied figs draped in truffle-worthy chocolate. Best of all was the bocadito, brioche sandwiches warm from the grill filled with fudgy melting chocolate and served with a luscious crema catalana dipping sauce. Considering the Spanish proclivity for seafood and pigmeat, there are a surprising number of vegetarian-friendly items on Barlata's menu. One of those shiny sardine cans (a specialty of the house, evidently) is filled with mixed mushrooms and parsley picada. Among the cold tapas are roasted vegetables with pine nuts, grilled Catalan bread with tomato, and two salads. Hot stuff includes a potato-onion tortilla without the sausage, vegetable-asparagus pasta with manchego, and fried potatoes with allioli. In addition, there's paella in two sizes, made with assorted vegetables and a vegan-approved broth. The reasonably priced 44-item wine list offers an extensive selection of vintages from just about every Spanish wine region: viuras and verdejos and tempranillos and tinto finos from Penedès, La Rioja, Almansa, and points between. (Semele Crianza's earthy Ribera del Duero tinta del país was especially yummy with the oxtail.) Sixteen are available by the glass. Eleven dessert wines and five varieties of sherry are offered as well (a glass of amontillado is practically compulsory with a saucer of cured olives and country bread), and soft drinks include the milky-white tiger nut-infused horchata from Valencia. Equally impressive is the beer list, which features Mexico's bitter, bracing Chupacabras and Canada's positively creamy Maudite red ale among a half-dozen other tasty rarities. Top-shelf Spanish foodstuffs — canned octopus, anchovies, and sardines as well as fig spread, allioli, olive oil, and tempranillo vinegar — are also available for purchase. Service is friendly, knowledgeable, and pleasantly opinionated, especially on the subject of wine and what to eat with it. All in all this is a lively and welcoming venue to enjoy a bit of Barcelona without leaving Temescal.